The change in the weather pattern is beginning. The high pressure ridge that has been off the coast is weakening and this will allow the jetstream (storm track) to drop southward. Today and part of Tuesday we will see mostly clear skies with some high cloudiness. Temperature will continue a few degrees above normal and there will be gusty north winds in some areas today. Tuesday night and Wednesday a weak frontal system will brush the north end of the state with some clouds and a few light showers over the north coast and northern mountains. Thursday the clouds increase as a slightly stronger system brings light showers to the mountains with a chance of sprinkle or shower in the north end of the valley. 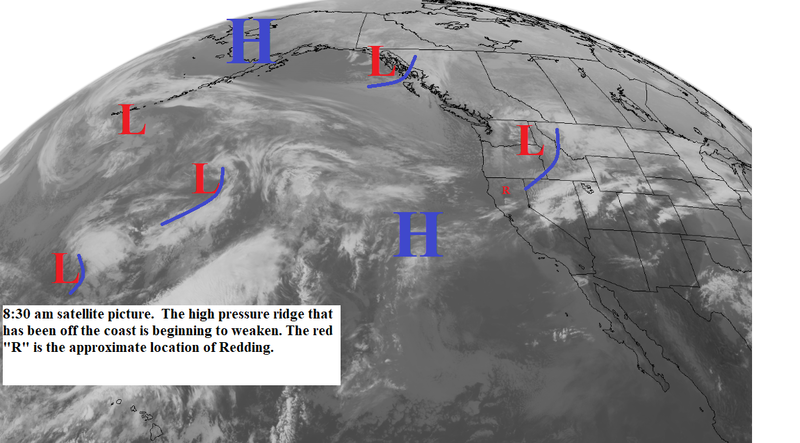 Friday and Saturday a strong (for this time of year) low pressure area will be along the west coast (see map below). Friday through midday Saturday we will have rain, heavy at times, with strong and gusty south winds. Snow levels will be 6000 feet lowering to 4000 feet by Saturday. The precipitation will turn to showers Saturday afternoon and Sunday and the winds will decrease. Monday looks partly to mostly sunny with another storm possible by Tuesday.